It’s a common sight throughout Riverside County – a Metrolink train zipping by at speeds of up to 79 miles per hour, filled with commuters heading to and from work or a recreational activity, or a freight train carrying a long line of cargo crossing at a busy intersection. But did you know that it can take the length of 18 football fields for a train to stop? That’s more than a mile! While the speed and power of trains makes for a great way to travel or transport goods, it also can be deadly for distracted drivers, pedestrians and cyclists. In fact, California leads the nation in railroad-crossing related injuries and deaths. This is why the Riverside County Transportation Commission and California Operation Lifesaver remind you to, “See Tracks? 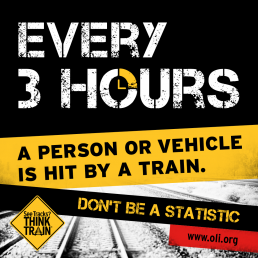 Think Train!” during Rail Safety Month and throughout the year. RCTC is partnering with local schools and universities to provide presentations with important lifesaving safety tips. Local businesses near the tracks also will participate. The only safe place to cross the railroad tracks is at a designated public crossing. It can take a mile or more to stop a train, so a locomotive engineer who suddenly sees someone on the tracks will be unlikely to stop in time. Railroad property is private property. For your safety, it is illegal to be on railroad right of way unless you are at a designated public crossing. Trains overhang the tracks at least three feet in both directions. If you are in the right of way next to the tracks, you can be hit by the train. Never walk around or behind lowered gates at a crossing, and DO NOT cross the tracks until the lights have stopped flashing and it’s safe to do so. Be aware that freight trains do not follow set schedules. Any time is train time! For more information on Rail Safety Month, please visit Operation Lifesaver at www.oli.org. Operation Lifesaver is an international, non-profit educational organization that seeks to reduce collisions, injuries and fatalities at railroad crossings and on the railroad right of way.